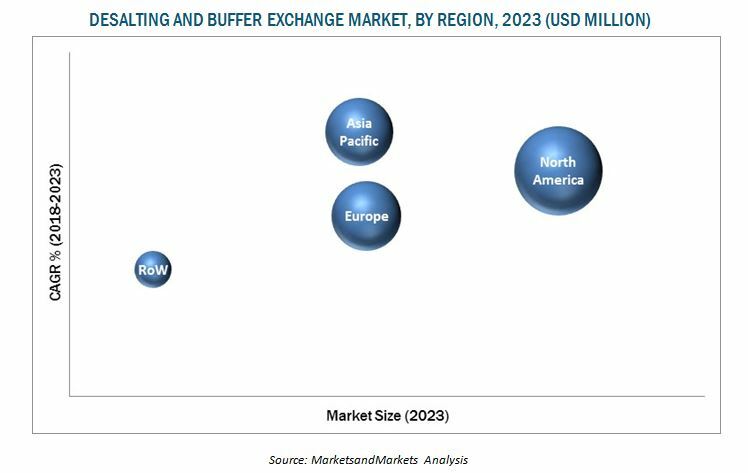 [119 Pages Report] The global desalting and buffer exchange market is projected to reach USD 1,094.8 million by 2023 from USD 679.8 million in 2018, at a CAGR of 10.0%. The base year considered for the study is 2017, and the market forecast is provided for 2018–2023. Growth in this market will largely be driven by increasing demand for mAbs, increasing R&D expenditure by pharmaceutical and biopharmaceutical companies, and growing focus on proteomic and genomic research. Both, top-down and bottom-up approaches were used to validate the size of the global market and estimate the size of various other dependent submarkets. Major players in the market were identified through secondary research and their market presence was studied through primary and secondary research. Secondary research included the study of the annual and financial reports of top market players, presentations, websites, and press releases of top players, news articles, journals; and paid databases ,white papers, medical journals, certified publications, articles from recognized authors, directories, and databases such as Clinical Proteomic Tumor Analysis Consortium (CPTAC), National Institutes of Health (NIH), National Center for Biotechnology Information (NCBI), US FDA, Chromatographic Society (ChromSoc), European Society for Separation Science. Whereas, primary research included extensive interviews with key opinion leaders such as CEOs, vice presidents, directors, marketing executives, and related key executives from various companies. The percentage splits, shares, and breakdowns of the segments were determined using secondary sources and verified through primary sources. This data is consolidated and added to detailed inputs and analysis from MarketsandMarkets and presented in this report. Key players in the global market are Thermo Fisher Scientific (US), Merck (US), GE Healthcare (US), Danaher (US), and Sartorius (Germany). The global desalting and buffer exchange market is projected to reach USD 1,094.8 million in 2023 from USD 679.8 million in 2018, at a CAGR of 10.0%. Desalting is a separation process that removes soluble low molecular weight substances, which have adverse effect on protein function or stability or interfere with downstream applications, from protein and nucleic acid samples. Size exclusion chromatography (gel filtration), ultrafiltration, and dialysis are major techniques used for desalting and buffer exchange. Growth in this market will largely be driven by increasing demand for mAbs, increasing R&D expenditure by pharmaceutical and biopharmaceutical companies, and growing focus on proteomic and genomic research. In this report, the market has been categorized based on product, application, technique, and region. The market is broadly segmented into kits, cassettes & cartridges, spin columns, filter plates, membrane filters, and other consumables and accessories based on product. The kits segment is projected to register the highest CAGR during the forecast period. Growth in this segment can be attributed to the increasing research and development in the field of bioprocessing and the increasing use of desalting kits for analytical sample preparation for SDS-PAGE and mass spectrometry. Based on the application, the market is segmented into bioprocess applications and diagnostic applications. The bioprocess application segment is expected to account for the largest share of the global market in 2018. The large share of this segment is attributed to the growing demand for biopharmaceuticals and monoclonal antibodies, as well as the increasing R&D expenditure by biopharmaceutical companies. The market is segmented into major 3 techniques: filtration, chromatography, and precipitation. In 2018, the filtration segment is expected to account for the largest share of the global market. The large share of this segment is attributed to the increased production of biologics and growth in proteomics and genomics research. In 2018, in terms of value, North America is expected to account for the largest share of the global market. The large share of this regional segment is attributed to the increasing demand for biopharmaceuticals, rising R&D expenditure by biopharmaceutical companies, and growing research activities in the field of genomics and proteomics. However, a dearth of skilled professionals is a major challenge for the growth of this market during the forecast period. Key players in the global change market are Thermo Fisher Scientific (US), Merck (US), GE Healthcare (US), Danaher (US), and Sartorius (Germany). These players focus on inorganic and organic strategies such as expansions, acquisitions and agreements to sustain their growth in the market.